I feel a bit badly about not having posted here yet this year, but for us the celebrating does not end with New Years. First we have Christmas, then one week later it’s New Year’s, and one week exactly after that is my youngest son’s birthday. It’s always a bit of a whirlwind! I so appreciate being able to have discussions with them, watching their interests develop, and seeing what fine young men they are turning into. Yes, it all has gone much too quickly for me and I do miss my little boys (and snuggling!) sometimes, but it’s amazing how they still really need their mom at this age – just in different ways. This kid is kind of shy, so even for his big “I’m a teenager now!” birthday, my youngest was not that keen on having all the attention on him with a big splashy party. 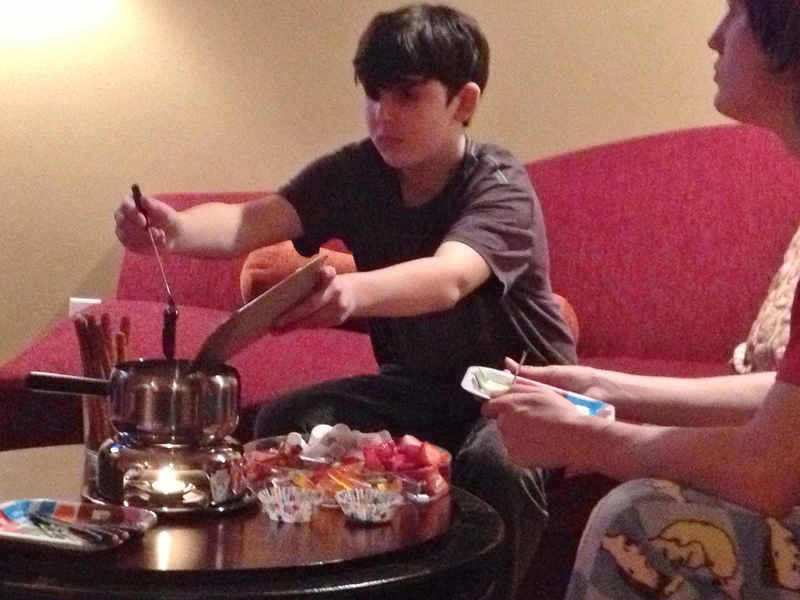 He’s never been a big cake person, (see last year’s Sundae Buffet), so for dessert he asked for chocolate fondue and we enjoyed our very own “non-party” fondue party! 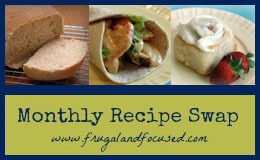 I bought a fondue pot at the thrift store last year for the chocolate fondue at my Mad Men Premiere Party and this recipe was perfectly delicious. So all we had to do was decide on what to use for dippers. 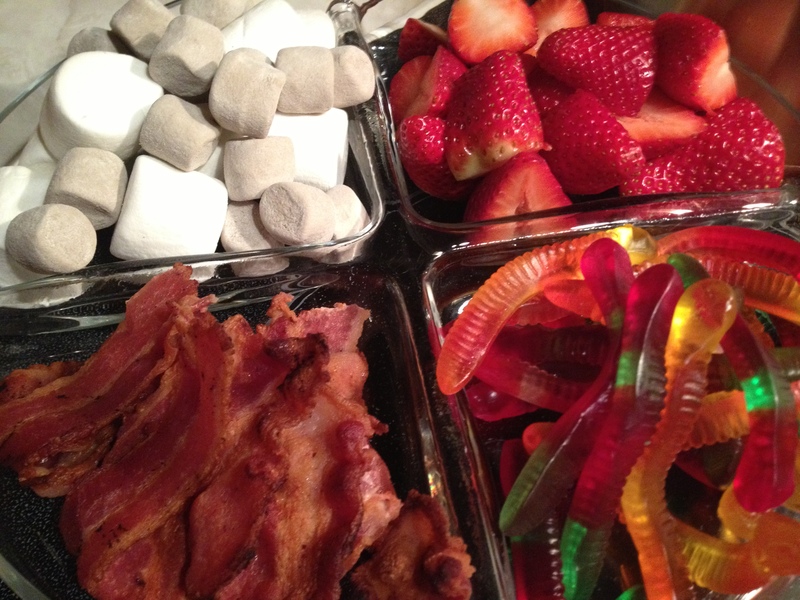 Marshmallows – chocolate (have you seen these?) and regular! 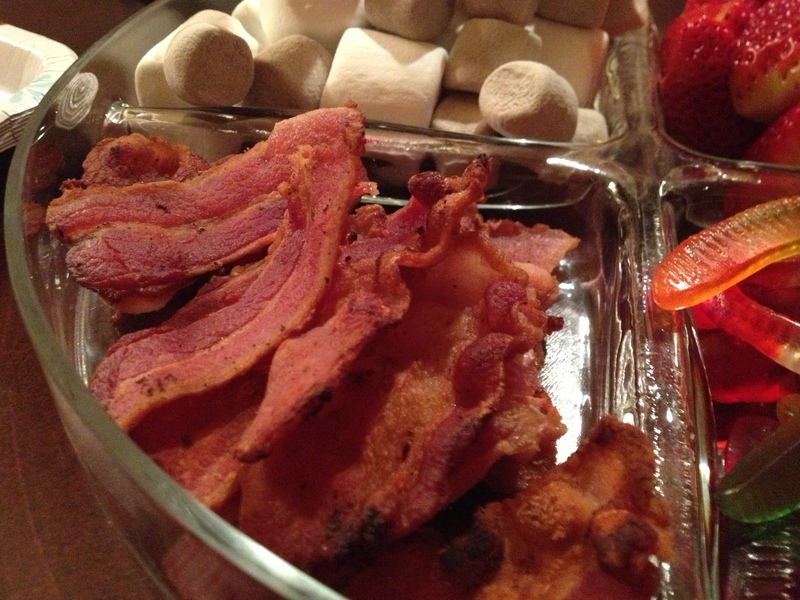 Bacon – yes, bacon. This was the favorite of the night! And how much more “birthday” can you get than adding some sprinkles to the mix! 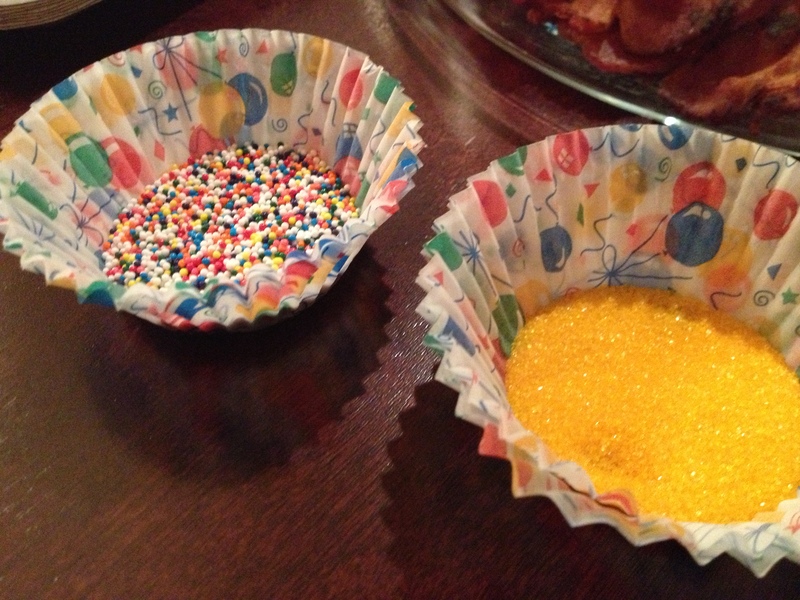 I simply poured different varieties into festive cupcake liners (doubled up) so that the kids could dip their items in the chocolate and then into the sprinkles. We had dinner at the table by candle light, but when it came to dessert time, I thought it would be fun to serve it up on our new coffee table/ottoman in the living room – what a perfect use for this piece of furniture. Isn’t he a handsome young man? How do you celebrate birthdays in your house without actually throwing a party? What types of non-cake birthday desserts do you enjoy? 1 – Yes he is Handsome! It’s funny you mentioning non cake birthdays – we never have them unless we have a party, BUT we (Me, Michael, & Marc) do like Creme Burlee, lemon bars & fancy brownies. It’s great when the birthday person gets to choose. BUT I do love making cakes for the special ed assistants that work in my kitchen at Ingraham High School. It’s fun to have them pick what they want for maybe the first time. Johnson even loved the one with the super hero theme – It’s was a 1′ tall cupcake that tipped in the car. Had to put a sign on the super hero saying he would go after the villian that tried to eat Johnson’s cake. 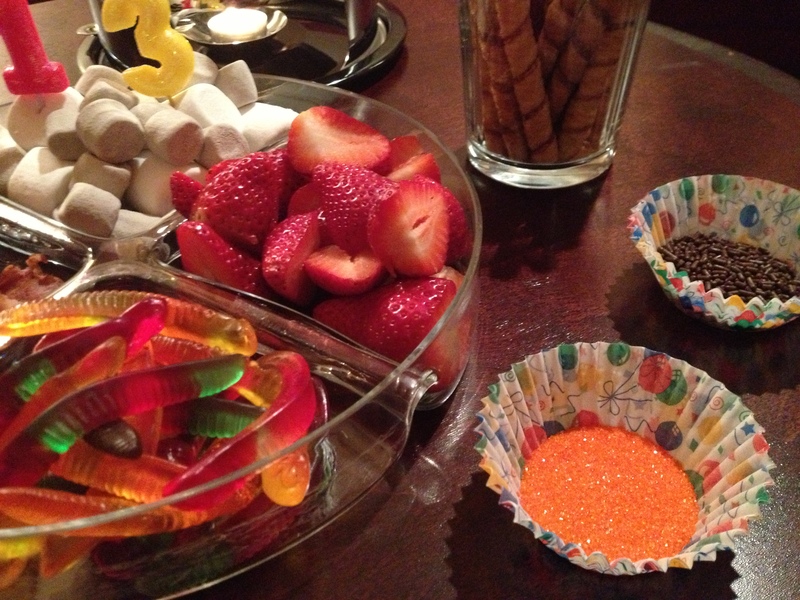 The other thing is 2 kids choose Strawberry cake, with strawberry frosting & candy + real strawberries. 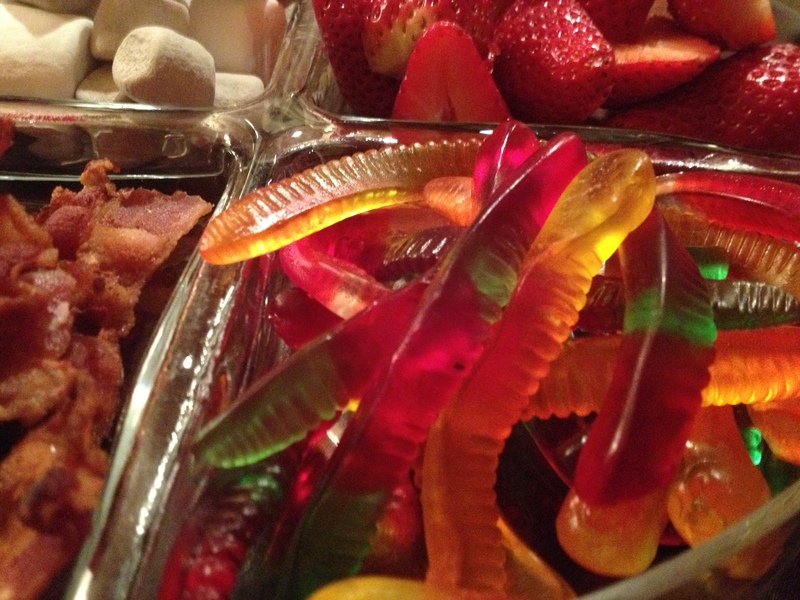 I love my kids but I’m not eating that strawberry bomb. Pingback: Oink! 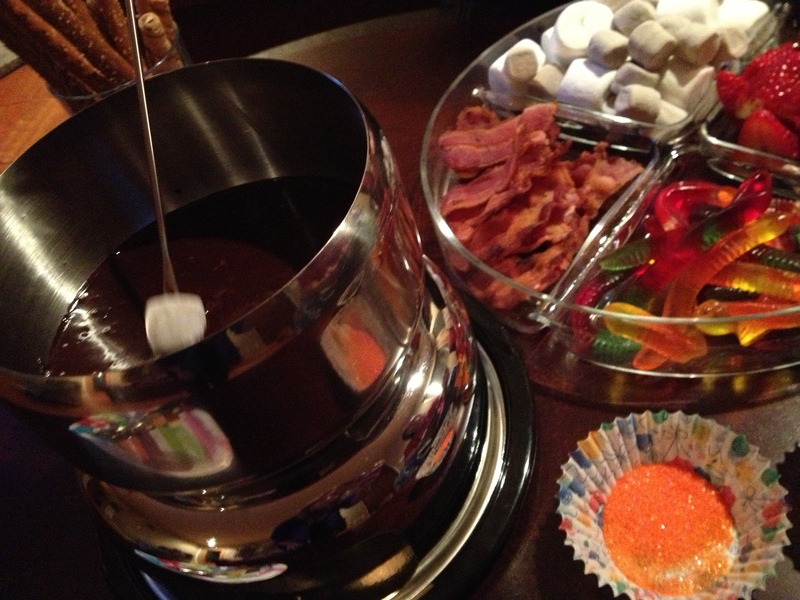 The Blog » do you fondue? Yum! Love the variety. 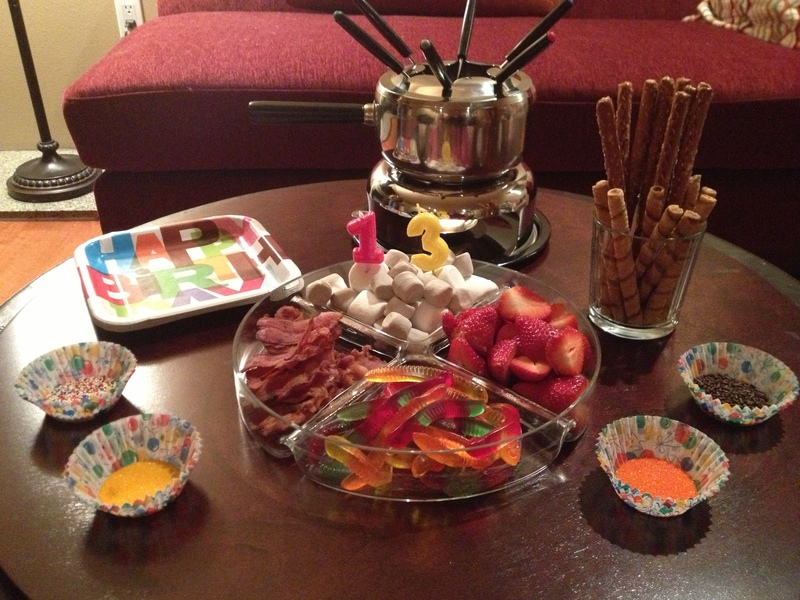 Fondue is such a fun way to celebrate. 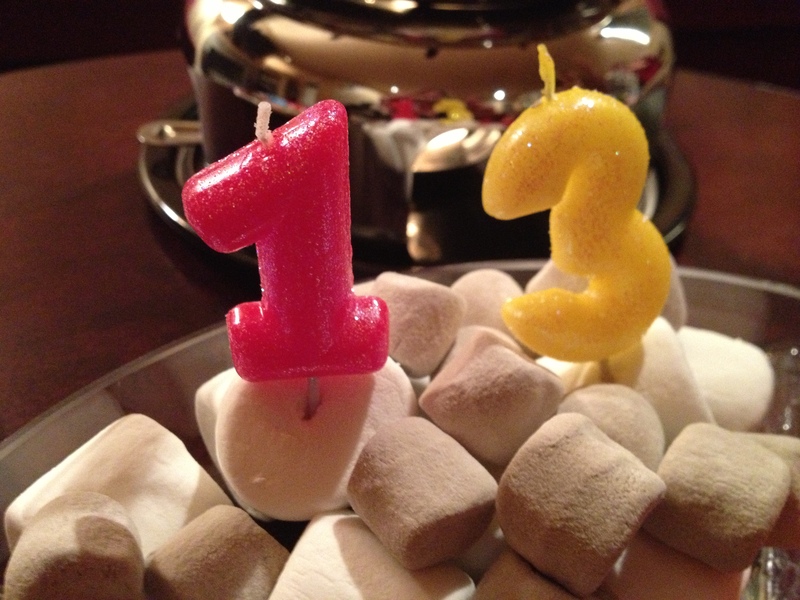 And Happy Birthday to your teenager. My oldest will be 13 this year. My girls had parties last year for the first time in years. We normally just have a fun outing as a family and then eat cake at home. We also let them choose the meal they want and they almost always want their dad’s grilled burgers. Thanks for linking up! Thanks for visiting Janet! My boys love the grilling that their dad does too – especially when he smokes ribs or turkey legs!